CARROLLTON, Ky. (May 2009)  The Kentucky State Park System is comprised of 52 state parks and one interstate park shared with Virginia. Carrollton is lucky enough to have one of them: Gen. Butler State Resort Park, where the 1859 Butler-Turpin House is about to receive an update. 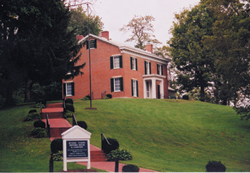 The Butler-Turpin House in Gen.
series that includes wine tastings. Funding was recently provided in the amount of $3,235.50 from the Kentucky State Parks Foundation to conserve and install historic reproduction Brussels and Wilton carpets in the home. Brussels is a loop pile, Wilton a cut pile carpet. The foundation decided this would be an appropriate use of its money because maintaining and restoring historical items is very important to them, said Erin Wright, volunteer coordinator for the Department of Parks. The foundation is supported through an endowment, private fundraising and donations. When my Old Kentucky Home (Federal Hill) received new reproduction carpets, two large carpets were salvaged from the historic home. Still in relatively good condition, but in need of conservation, these carpets were brought to Gen. Butler to be stored with the hope that funding would become available to conserve (clean) and install at the Butler-Turpin State Historic House, said Evelyn Welch, Historic Site Museum Manager for the Butler-Turpin State Historic House. Both are appropriate for the time period of the Butler-Turpin House. The Brussels carpeting will be placed in the hallway and the Wilton will be installed in the parlor, complementing the homes Greek Revival woodwork and family heirlooms. The home currently has area ingrain carpeting. Depending upon the wealth of the family, ingrain carpets would have been found in other rooms of the home but that would not have been the case for the very wealthy, said Welch. In the 19th century Wilton carpets, which have a plushy, velvet look, cost double the price of Brussels carpets and would have been used in the best rooms of a home. Floor coverings were highly prized during this Federal period and very costly. Wealthy American families had Brussels carpets in the remaining rooms of their homes. At first glance, Brussels carpets resemble tapestry carpets with the pattern showing through on the wrong side. They were manufactured for rooms with not much hard wear. Evidence was found of carpet up to the baseboard on the staircase landing. The Butler-Turpin family, as would be the case for any family, would have these carpets in the best rooms, Welch said. The grant from the Foundation is a matching grant. The match may be supplied in the form of funding or services (labor), said Wright. Such grants do not have to be repaid. Welch is currently working on a funding match for much needed repairs on the Butler-Turpin Houses exterior brick steps. Anyone with masonry experience who would like to volunteer their expertise or time is encouraged to contact Welch. The Butler-Turpin State Historic House is open for public tours from 9 a.m. to 4 p.m. Wednesday through Saturday, and from 1 p.m. to 4 p.m. Sunday. Admission is charged. The Kentucky State Parks Foundation awarded a total of five grants in the amount of $16,735 for state park projects. The foundation was established in 2007 as a non-profit to promote the resources of Kentuckys 52 state parks. The foundations first purchase was an officers sword carried in the War of 1812. It was used by Green Clay while leading his Kentucky troops. The sword stayed in the family until the 1980s, when it was purchased from a private collector.  John James Audubon State Park, Henderson, $5,000 to redesign and create a new main playground area.  Dale Hollow Lake State Resort Park, Burkesville, $4,500 to construct an historic interpretive one mile loop trail.  Jenny Wiley State Resort Park, Prestonsburg, $1,500 to conserve and frame the White squaw drawings.  E.P. Tom Sawyer State Park, Louisville, $2,500 to improve the Goose Creek Trail.  For more information, visit: www.GeneralButlerLivingHistory.org.